Line is a popular messaging app like WhatsApp and WeChat, working over the internet and allowing users to communicate not just via text but also through images, videos and much more. However, like its counterparts, your Line receives so many messages, images and videos every day letting it slowly eat up your iPhone storage space. Also, every Line chat stored on the iPhone can be a privacy concern for many. If your iPhone goes into someone else’s hands, they may be able to go through your complete chat history, which might not be what you want. Hence it is always advised to clean the Line chat history on iPhone from time to time to free up space and protect privacy. In this article, we will share several ways you can do for deleting Line Messaging history on your iPhone. Bonus Tips: If you accidentally deleted iMessages from iPhone or iPad, you can always use Gihosoft iPhone Data Recovery to get them back easily even without backup. Before we begin explaining the procedure on how to delete chat history of Line Messaging App on iPhone, be aware of the fact that this process is irreversible. It will delete all your chats and they cannot be recovered again. So be sure of what you want to do before you proceed with the steps below. If you want to delete a specific chat message of Line Messaging App on iPhone, then you can follow the below steps. Open the LINE messaging app on your iPhone. Long press on it and choose ‘delete’ in the options given, and confirm your deletion. In the chats list, scroll to the chat you wish to delete. Click on the delete button to permanently delete that chat history. Or you can click into a chat room, and tap on “V” at the top to Settings > Delete chat history. You can repeat this for deleting multiple chats or use the Multi-select feature if you want to specifically delete a few chat histories of Line Messaging App. If you wish to delete all your Line chat history on iPhone while you have hundreds of chats, then above-mentioned method will be tedious for you. For such scenarios, you can follow the below steps. From the options presented, click on Settings. Under settings, you will find an option named Chats. Under the submenu of Privacy, click on All Chat Data > Delete Data and confirm again on the popup that opens. And you are done. All your chat history of Line Messaging App will be permanently deleted from the device. This is another way you can completely remove your Line app chat history from your iPhone. Deleting the app completely removes all the app traces and the data it had. So just delete the app from your iPhone for complete cleaning. You can do that either by long pressing on the Line app till it starts wiggling, and then click on the x on the top left corner followed by deletion comfirming. Or you can simply go to Settings > General > iPhone Storage, then scroll to find the LINE app, and click into it to tap on ‘Delete App’. If you are afraid of something left over, restart your iPhone, and later reinstall the Line app. Do not click on the “offload app” option as it will uninstall the app but perserve its data safe on the iPhone, so that next time when you install the app, all the data will still be presented. 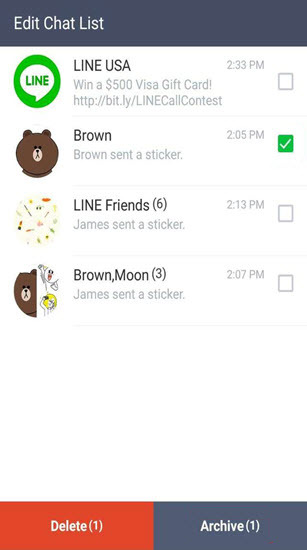 LINE is a great instant messaging app and is used by millions of people around the world. People love it because of the amazing features such as the ability to make free group calls of upto 200 people. If you ever find yourself in the need to delete your line chat history, then this guide will surely help you. The step by step instructions we have detailed above will help you permanently remove all traces of Line chat history from your iPhone. If you have any suggestion or question, welcome to comment your idea down.